Ever heard of Almond Milk? 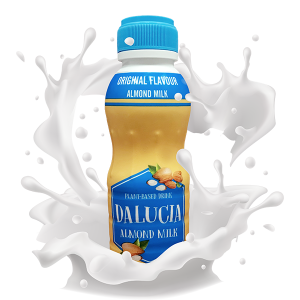 We’re glad to announce that The Dalucia is the #1st national brand ever to introduce almond milk in Malaysia. We have come out with healthy and addictingly delicious almond milk flavours; — minus the excess saturated fat & cholesterol. Lesser calories, fewer worries of gaining that waistline. Available in Original, Chocolate & Dates flavour. Try one today. Almond milk can be a healthy substitute for dairy milk if you are watching your weight. Regardless if it’s plain, sweetened or flavoured, it still has fewer calories & less fat than cow’s milk. Our almond milk contains low cholesterol and low saturated fat. It also has natural omega-3 fatty acids which are great to prevent high blood pressure and promotes overall heart health. Almond milk is rich in vitamins that can give a nice daily boost to the immune system. Added B vitamins & iron also promotes healing and muscle growth. 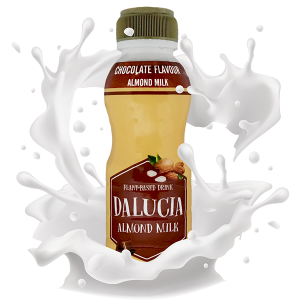 We use almond nuts as our main ingredient to produce high protein drinks. Yes almond milk can too be good for growth. Almond milk contains antioxidant properties essential to our skin’s health as it consist of 50% of the suggested daily amount of vitamin E.
Almond milk keeps your digestion in check as it has nearly 1 gram of fibre per serving. Fibre as we all know is important for healthy digestion. One Thing We Can Guarantee, They’re Addictingly Delicious!